The Whitsundays is on the same latitude as Rio de Janeiro, Mauritius, Tahiti and New Caledonia. The climate is subtropical with an average daily temperature of 27 degrees. That makes the Whitsundays and Airlie Beach and ideal place to visit just about any time of the year. The summer months can be challenging to some with January is the warmest month averaging 30 degrees. By contrast our Southern cousins wonder why we are rugging up in July when some day time tempuratures dip to 23 degrees. School holidays are always busy, particularly the September / October break. It is at this time that the sea and winds are at their calmest for the year combined with sublime day and night time tempuratures. This also makes it the busiest time of year in town generally filling restuarants and island day trips, so you are advised to booked ahead! As the year closes in on Christmas the fun continues with mid october being the time of the Whitsunday Reef Festival, then Schoolies and the full Christmas break. The town otherwise thrives on the constant flow of International tourists in the form of back packers and the new bread "flash-packers" - young professional internationals choosing to travel randomly with deeper pockets. No backpacking visitor to Australia does so with out sailing to the internationally famous Whitsunday Islands on an overnight sailing trip. This group make a spectacle about Airlie Beach, lounging at the Airlie Beach Lagoon or main street bars. Airlie Beach is the gateway to the Whitsundays playground and the holiday village of Airlie lies on the shores of Airlie Bay - a pretty palm fringed beach overlooking blue calm waters dotted with sailing vessels of all sizes from all over the world. The location of the village makes Airlie Beach the coastal hub of the Whitsundays, and a mecca for tourists wishing to dive the Great Barrier Reef, or sail around its 74 islands visiting the many tropical Island Resorts or in search of their own secluded palm fringed piece of paradise. 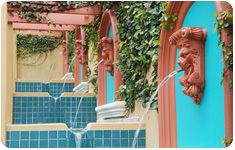 Situated 200 metres above the township of Airlie Beach, Toscana Village is a Tuscan style resort offering elegantly appointed apartment accommodation with unsurpassed views over the turquoise water of the Coral Sea to Hayman Island and beyond. 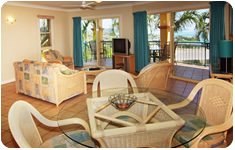 Toscana Village Resort is a popular choice for accommodation in Airlie Beach selected for its spectacular views and close proximity to the restaurants, cafes and the beach. A range of accommodation packages available cater from couples to large families. Experience the wonders of the Whitsundays by choosing from the myriad of activities available - sail in a famous race winning maxi yacht, take an exhilarating fast ocean raft ride to the pure white sands of Whitehaven Beach, dive and snorkel the outer reef, jetski, parasail, go horse riding or surprise someone special with a helicopter or seaplane flight to a secluded beach armed with a specially prepared romantic picnic hamper. Make your Whitsundays holiday a memorable experience! If your idea of a perfect holiday in Airlie is to relax - choose a book from our guest library and hide away in a quiet corner around one of the four pools at Toscana Village Resort. For total rejuvenation and relaxation book our specialist masseuse to soothe away those work blues.